Doing great keyword research is like being a fisherman. Reeling in the big profits takes knowledge, a Speedo, and a thermos. Whether you like it or not, keyword research is at the core of pay-per-click marketing and SEO practices. If you aren’t bidding or using the right keywords, short- or long-tail, then you could be selling yourself short on your potential success. See, doing good keyword research is like being a seasoned fisherman, casting his net at the right place, at the right time. So whether you’re looking to patch up the holes in your current keyword selection net, or expand the size of it, consider this article a potential algal bloom of profits. By now you should know that the Google AdWords Keyword Tool is no longer available – Google has folded the tool into Keyword Planner, a combination of the old keyword tool and the Traffic Estimator. Now, you need an AdWords account to get keyword suggestions from Google. But Google is far from the only keyword game in town. In this article, we’ll look at my eight favorite keyword research tools, plus some fancy tricks you can use to get a wooden peg leg up on your competition. Some are free, and some are not (but well worth the money). The WordStream keyword tool allows you to target certain niches (groups of related keywords), gives you further suggestions, and also allows you to group them based off of a common theme for easy ad group launches. 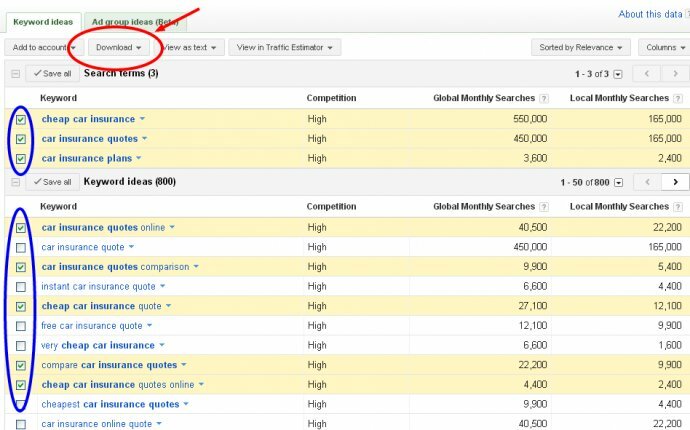 This keyword research tool gives you 30 searches for free, after that you’ll have to sign up for their WordStream Advisor to use it additionally. Hidden bonus? You get a free 7-day trial on top of the 30 free searches you already did! Though not free, FreshKey is my #1 go-to keyword research tool that allows me to see beyond the regular Google Instant suggestions and predictions that appear when I start typing things in on Google. Not only does it give you new keyword ideas, variations, and synonyms, it also sorts the keywords depending on popularity. Instead of just getting four new keywords from the Google suggestions drop-down, you can now potentially get an unlimited amount of keywords if you keep adding small letter variations like a, b, c, d, etc. to the end of your keyword root. FreshKey will even give you ideas of which negative keywords to add before you actually have to pay for them the old-fashioned way by going through your search query report. You can also use it to get Amazon search box suggestion terms. You can also export the keyword results as a spreadsheet or copy them directly to your clipboard. If you have multiple channels you wish to do keyword research for and want to sound like an idiot explaining the pronunciation of this tool to your watercooler buddies, then Soovle is a perfect fit. Soovle allows you to explore the most typed in keywords on multiple search engines based on the keyword root you give it. It even includes Amazon and eBay. Not only is it a great keyword research tool to use, but it’s also a great brainstormer as you can slowly start typing in your ideas and allow it to auto-generate its own ideas. Ubersuggest takes any keyword you give it and immediately gives you an almost unlimited list of alphabetized and numerical keyword variations of your original keyword. You can even take it further by adding “bounce house ab, ac, ad” to uncover more keywords that you could potentially bid on or use for SEO purposes. Now even though you won’t be expanding your keyword net by using search query report mining, you’ll at least be improving your AdWords or Bing Ads account by patching up holes. One common thing I notice in PPC accounts is the lack of attention and detail in which the account owner or previous agency allows one or a couple of keywords to be the “catch all” for everything. A common example would be to have the keyword +bounce +house or “bounce house” and leave it at that. The search term/query report is a PPC report that shows you what search terms have actually triggered your ads based on the current keywords you’re bidding on. So it won’t expand your reach since your ads are already showing for those terms, but it will help you improve your quality scores and granularity within your account. Duuuhhh...! Of course this is on the list. The Google Keyword Planner will show you some pretty neat stats like average monthly searches, competition level (high, medium, or low), the average cost per click, and more. @anseoonline If you are doing SEO , worth mentioning Google Webmaster Tools in the chat. So many great tools there which can help. @Steve Haldi: Use #Google Webmaster Tools to identify and fix broken links and other #SEO-unfriendly site issues.